Before joining SMIT Salim Mikram accumulated more than 10 years in investment banking and strategy consulting in various positions. 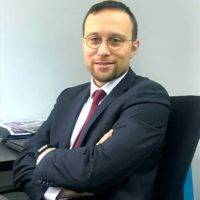 He worked for more than 4 years JP Morgan Chase Bank in London in several positions before joining Upline Corporate Finance, a boutique investment advisory firm based in Casablanca, Morocco. As such, he advised prominent shareholders and investors in some of the largest merger and acquisition transactions in Morocco at the time. In 2011, Salim joined SANAM GROUP, a cross sector holding company advising the top management on the overall strategy of the group and some restructuring programs in affiliated firms. Late 2015, he joined the Moroccan Agency for Tourism Development (SMIT MOROCCO), the Government body in charge of destination development, supervising the implementation of the tourism investment promotion strategy in Morocco. Salim holds a Master of Science degree (MSc) in Business and Finance from Reims Management School (France).